New Jersey parent Michele Thornton's 9-year old daughter, Cassidy, was recently banned from attending an end of the year party for students at her elementary school because Michele had previously opted her daughter out of New Jersey's version of Common Core testing, known as the Partnership for Assessment and Readiness for College and Careers exam (PARCC). PARCC has been criticized by experts as being part of a wider plan to nationalize school curricula, the primary reason Michele had instructed her daughter not to participate in the test. According to Thornton during her Fox News interview, “They pressured me to make her take it,” she said. “I told them that it was against the law to force my daughter to participate." “Untest afternoon will take place Monday, June 15 beginning at 12:30 pm for children in grades 3-8 who participated in both PARCC assessment..."
Since Cassidy was the only child in her third grade class not to take the exam, school officials were going to place her alone in the school library for the rest of the day, a move which caused quite a stir with Michele, causing her to instead go and pick up Cassidy from school early while the other children went on to enjoy "...gaming trucks, an outdoor play area (soccer and volleyball), cupcakes, juice boxes, and buckets full of prizes for the kids." The "Untest afternoon" was not the only attempt to guilt Michele and Cassidy over their refusal to take part in PARCC; Cassidy was pulled out of class and drilled with a series of questions as to why she refused to take the PARCC exam. Michele, increasingly frustrated with the administration's treatment of her daughter, launched a formal complaint, which resulted in an investigation showing that "findings indicate that harassment, intimidation and bullying did not occur." Michele's story of school intimidation to implement Common Core testing is far from uncommon in America today. An Ohio family was at odds with their daughter's local school district when they asked for their daughter to opt out of Common Core testing, which resulted in the Superintendent "refusing to excuse her children from anything at school, then visited her kids’ school, demanding to have the children weighed and measured because their principal had allowed them to opt out from an earlier body-mass index screening." "Dr. Terrance Moore, professor of History from Hillsdale College, dedicated an entire chapter in his book called Story Killers to this very textbook. He does a superb job detailing the misrepresentation of America’s founding, its anti-American themes, and its obvious political bias, as well its mediocre methods of teaching literature." 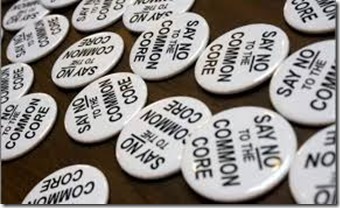 Common Core is threatening not only parents' rights over their children's education, but is also undermining individual states who have to choose between opting out of Common Core and losing federal grants, or allowing the Department of Education to come in and take control over entire curricula. Stop delegating teaching responsibility to a third party. It may seem surprising to consider licensing reform a criminal justice issue, but if you get to the meat of the issue then it makes sense. Unsurprisingly, barriers to employment make it harder find a job and that can result in those who can find work returning to crime. Breaking with the Trump administration, Sen. Mitch McConnell (R-Ky.) ecently announced that he intends to protect the health insurance company subsidies that had previously been a part of ObamaCare. This is all in line with the Senate Majority Leader’s desire to stabilize the market which he believes is “collapsing” (in large part thanks to ObamaCare). Though reform in this field is absolutely necessary, doling out handouts to well connect insurance companies who helped write the bill are only going to help prevent necessary reform and continue a crony mindset in Washington that needs to go the way of the dinosaur. The most vulnerable people in America are on the brink of losing their health insurance and messaging from the Left has been consistently silent about addressing the issue, other than somehow blaming it on Republicans. Iowa’s individual healthcare market is hanging in the balance of monumental collapse. The fact is that the so-called “Affordable Care Act” is anything but affordable and has attacked the insurance market by doubling premiums and no one on the Left seems to want to talk about it. Rose George, the author of the book Ninety Percent of Everything, spent several weeks traveling a total of 9,288 nautical miles aboard the Maersk Kendal, a British shipping vessel. Reports continue to come in about the results of implementing ObamaCare. Recently, the Centers for Medicare and Medicaid Services (CMS) of the Department of Health and Human Services (HHS) released a report on the effectuated enrollment, or in other words selected a plan for the first two months of the year and paid their first month’s premium of ObamaCare. The results were admittedly rather surprising as they did not meet the expectations of where the program was supposed to be at this point. The Trump White House will seek to boost technology investment with a series of meetings this week. Dubbed as “Tech Week,” the meetings will include Silicon Valley and venture capital heavyweights and will prioritize discussing deregulations that would help investors develop 5g Internet, drone, and “Internet of things” technologies. Attorney General Jeff Sessions issued a memo to his staff last month that instructs prosecutors to charge suspects with the most serious provable offenses, "those that carry the most substantial guidelines sentence, including mandatory minimum sentences”. Free Markets: A Truth Within Science? A perfect example of spontaneous order and division of labor can be found in the vast wonder of the universe.